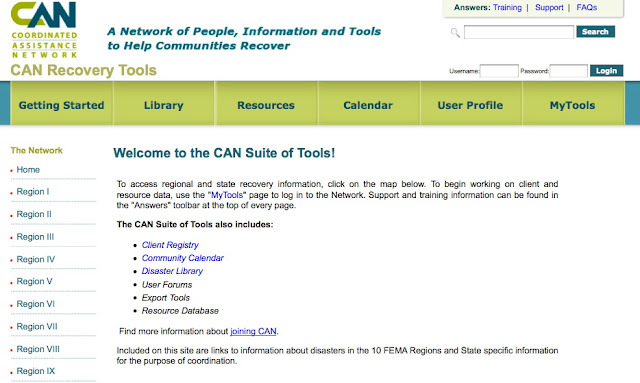 Thanks to a wonderfully coordinated effort (no pun intended) by both the national CAN staff and VisionLink's development, Q&A and Help Desk staff, the new national Coordinated Assistance Network solution has been released across the Web. This major rebuild provides client I&R and case management portals which match the FEMA disaster regions, communication tools that support both nation-wide messaging and disaster specific needs, and extraordinary security and permission tools that provide granular controls over portal access and client record access. In addition, a great deal of useful resources, libraries of information, online tutorials and much more have been added to this national system. This is literally the nation's most advanced multi-agency, multi-jurisdictional solution for coordinated disaster relief and recovery. I doubt that the founding members of CAN ever envisioned it's rapid growth, to what is now some 1,300 affiliated partners. Built to respond instantly to the changing dynamics of real disasters, content, forms, client registries, case management tools, dashboard reports and much, much more can be dynamically and instantly adjusted to meet the needs of a national disaster, or to the meet the needs of many smaller disasters simultaneously. With this kind of flexibility, needs can be met more coherently, and the technology can become only an enabling tool--while the focus can stay on those in need. VisionLink is truly honored to support this extraordinary partnership with CommunityOS.